April 03, 2019: The Chhattisgarh Board of Secondary Education (CGBSE) usually announces the CGBSE 10th Result 2019 as well as the CGBSE 12th Result 2019 during the month of May. The CGBSE officially conducts the CGBSE Class 10 Exam during the month of March. You can check your CGBSE 10th Result 2019 on this page. This year, the CGBSE Class 10 exam will start on 01 March, 2019 and end on 23 March 2019. The exams will be conducted in a single session from 09:00 am to 12:15 pm. The CGBSE 10th Result 2019 is expected sometime in the month of May, 2019. The official Class 12 exam dates for the academic year 2018-2019 have also been announced by CGBSE. The exams will commence on 02 March, 2019 and it will continue up to 29 March, 2019. For regular updates about the CGBSE 10th Result 2019, sample papers, Chhattisgarh Board Class 10 time-table keep visiting this website. Type the desired state name, in this case-http://www.examresults.net/chhattisgarh/. Look for the link which says CGBSE 10th Result. 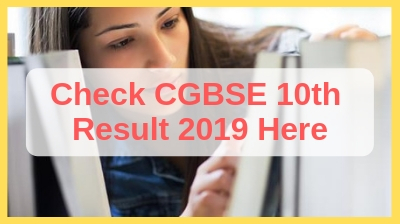 Click on the link and fill in all the details to get your CGBSE 10th Result 2019. The Chhattisgarh Class 10 final exams 2018 exams began on 5 March, 2018 and ended on 28 March, 2018. The Chhattisgarh Class 10 final exams 2018 result was announced on 10 May, 2018. Girls outperformed boys in the class 10 board exams, the results for which were declared in May. About 3.97 lakh students appeared for the exams of which only 68 per cent passed. Yogesh Singh Chauhan with a total of 590 out of 600 marks was the topper. Those who did not succeed in clearing the exams had the option of taking the compartment exams or appearing for the papers again next year. Around 3.9 lakh students sat for the Chhattisgarh Class 10 final exams 2018. The CGBSE 10th result 2019 can be expected to be announced in the last week of April or the first week of May, 2019. Where to Check Chhattisgarh Board 10th Result 2019? You can check your CGBSE 10th Result 2019 & CGBSE 12th Result 2019 from www.examresults.net website along with the official CGBSE website- http://cgbse.nic.in/. Bookmark this page (CTRL+D) for future reference. for CG Board 10th Result 2019! The Chhattisgarh Board of Secondary Education (abbreviated as CGBSE) is a board of school education in the state of Chhattisgarh, India. It previously existed as a School Education department of the state of Chhattisgarh. With the formation of Chhattisgarh as a separate state on the 1st of November, 2000, Chhatisgarh government School Education Department was upgraded to Chhattisgarh Board of Secondary Education on 20 September, 2001 under Legislative Notification No. 10-5-/13/2001-Raipur-20-7-2001. The board controls, regulates, and looks after matters associated with school education in the state of Chhatisgarh. It is responsible for the promotion and development of secondary education in the state of Chhattisgarh.